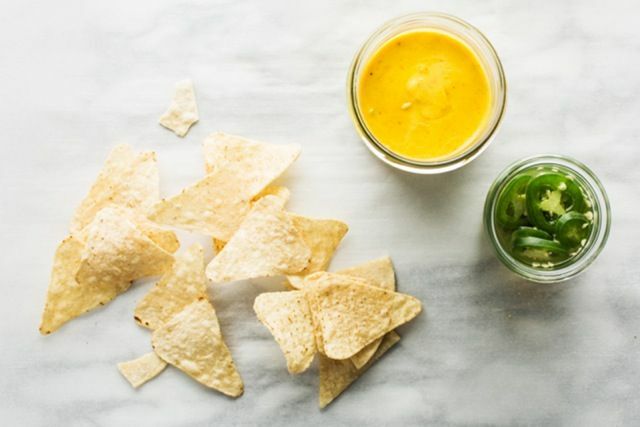 Today, Lara Ferroni shows us how to make a smooth and creamy nacho cheese dip and pickled jalapenos in a flash. Lara is the author of Doughnuts: Simple and Delicious Recipes to Make at Home, and the forthcoming book, Real Snacks: Make Your Favorite Childhood Treats Without All the Junk. While I never had a real fast food worker experience as a kid, I did work for several years at the local movie theater, where in addition to an inordinate amount of popcorn, we made a lot of movie theater nachos. You know the kind with the little plastic dish with the special cup for the nacho sauce. Trust me on this one, you don’t want to know exactly what is in that cheese sauce, but I’ll tell you that it does come in very large cans and is closer to plastic in texture before it’s heated than anything you should eat. 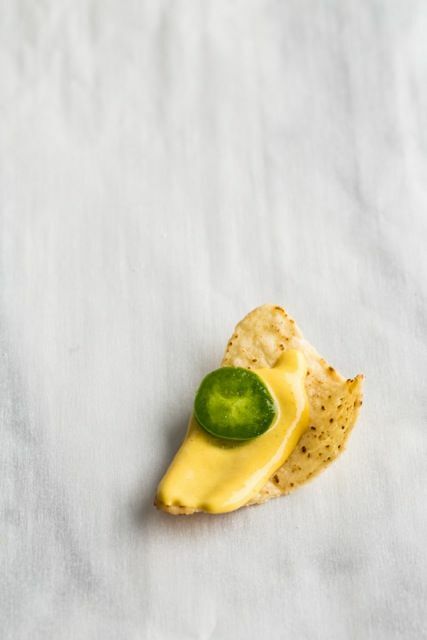 There was nothing nacho-y about the cheese itself -- that effect was created by pouring a bit of the pickling brine from the equally large cans of pickled jalapenos, after first scraping off some weird oily black stuff off the top. You have my sincere apology for ever being involved in serving such crap as food. And yet. 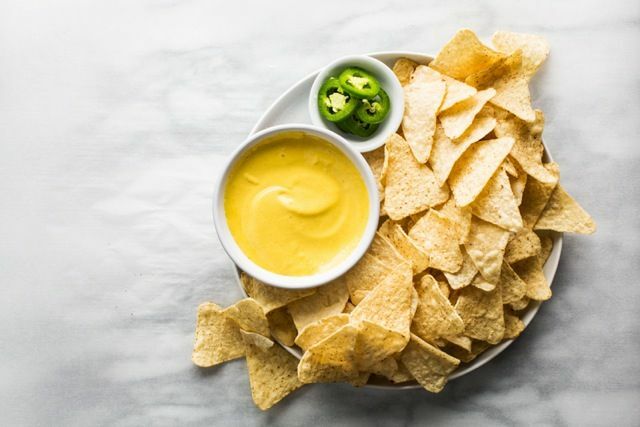 As gross as it was to see how that nacho cheese was made, it still kind of tasted good, and there have been more than a few times that I craved the velvety spicy cheese alongside my chips. 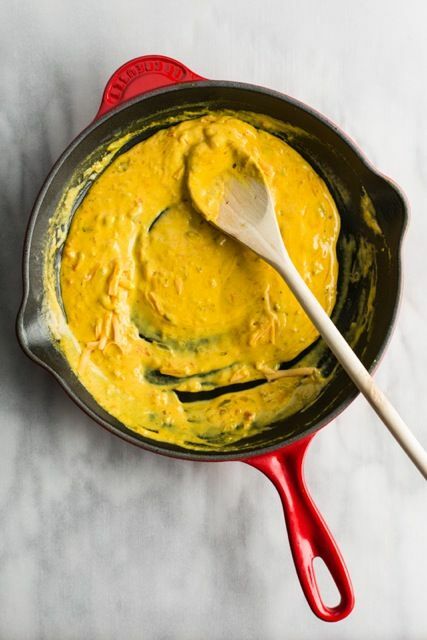 This nacho cheese sauce, made with far less scary ingredients, is based on the Chile con Queso recipe in Real Snacks, but with a bit of turmeric thrown in to give it that classic cheese sauce color. It satisfies that craving and is the perfect little snack for the Big Game day or a quiet movie night. 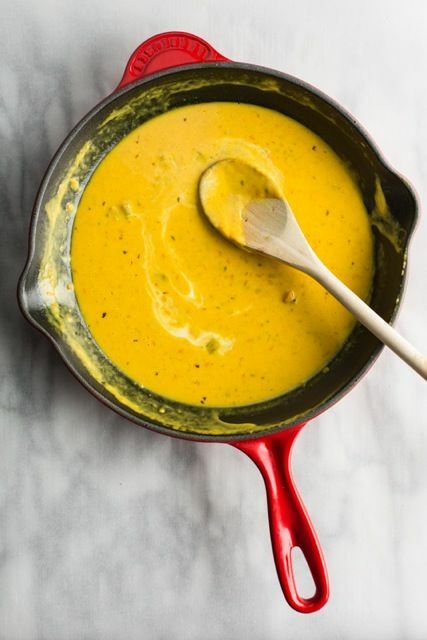 While you might be inclined to use cheddar cheese in this sauce, I’ve found that Monterey Jack gives a much better texture -- cheddar just won’t get as smooth. If you really miss the cheddar flavor, try adding half cheddar and half jack instead. Melt 2 tablespoons of the butter over low heat in a sauté pan. Add the onion, green chile, tomato, turmeric, paprika and cayenne pepper. Cook for 5 to 10 minutes until the onion softens completely. Add the remaining butter and the flour, and continue to cook on low for another 2 minutes. Add the cream, ½ cup of the buttermilk and cheese and stir to until the cheese melts. Add in the remaining buttermilk a little at a time until you get a velvety sauce, about 10 minutes. Transfer the sauce to a blender (I use a hand blender) and pulse until completely smooth. Stream in the olive oil and continue to blend. Season with salt and pepper to taste. 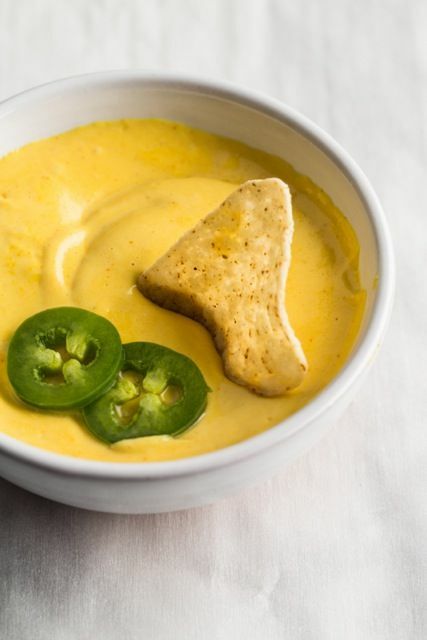 Serve with chips and pickled jalapenos. You can make this sauce a day ahead and keep it in a sealed jar. Reheat in the microwave for a minute, stir, and finish heating another minute to serve. 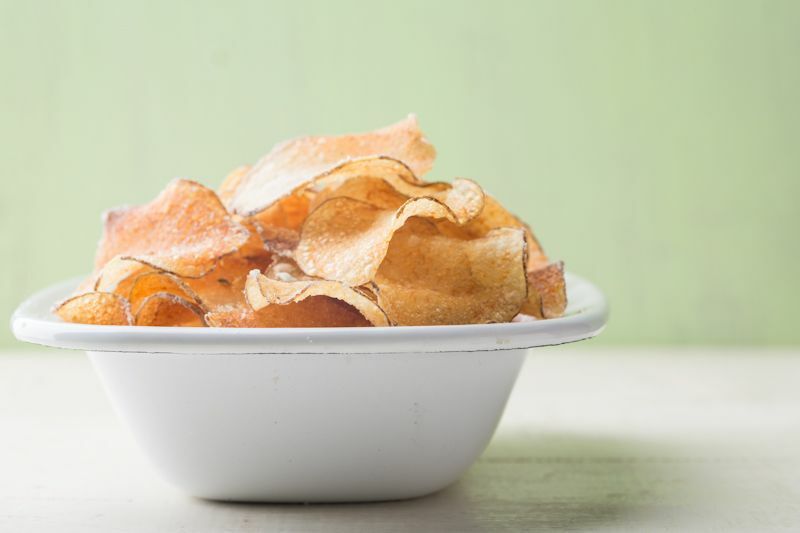 Place the salt, water, and vinegar in a bowl and heat until the salt dissolves (the microwave is fine for this!). Slice the jalapeno into rounds, and add to the brine. Cover and refrigerate for at least 30 minutes. Lara Ferroni is a former tech geek turned food geek who spends her days exploring the food culture of the Pacific Northwest. As a writer and photographer, you might spy her digging through bargain bins for the perfect prop, or dreaming up delicious new ways to use teff, or eating and drinking her way through Portland's vibrant food culture. Her photos have been featured in websites and magazines such as Epicurious and Edible Communities, as well as over 10 cookbooks, including her own, Doughnuts (Sasquatch Books) and Real Snacks: Your Favorite Childhood Treats Without all the Junk (Sasquatch Books), as well as a food photography how-to book, Food Photography: Pro Secrets for Styling, Lighting & Shooting (Pixiq). You can find more of her tasty photos and recipes on her blogs, CookandEat.com and StillLifeWith.com. I saved this recipe to make on Super Bowl Sunday. Personally, I didn't think it was that much work, and it thickened nicely. The ingredients don't need to be chopped too finely, because they all get smooshed up in the blender, anyway! I put vinegar in the milk so it worked just as well as buttermilk, and I used sharp cheddar instead. My family loved it (even though I forgot to salt and pepper it). I enjoyed making it and my daughter commented that it was nice to know exactly what went into this dip! Thanks! I agree with NapaCook, for the result there was a lot of work. Mine came out thin, so I added more jack cheese and I found it a bit gritty anyway. Flavor was okay and I'll use the leftovers on a vegetable. Made this for a Super Bowl snack. It was popular, though not in proportion to the amount of work that went into it. It was a fun experiment none-the-less, just not sure it's going to become a snack standard. I used about half the buttermilk called for in the recipe. Go slow with the second addition and taste as you go along. Oh, and I inadvertently discovered that this pairs much better with fritos than with tortilla chips! Tasty dish! Does the recipe double well? Yes.. you should be able to double or triple it easily. I'm also wondering what type of green chili is recommended for the nacho sauce. I'm partial to Hatch green chiles... you can use either the mild or hot depending on your tastes. bgavin, the hand blender helps emulsify the cheese fats into the rest of the sauce. This is especially important for achieving that velvety smoothness mentioned above. I've had a lot of luck lately using the Modernist Cuisine-suggested technique/ingredient sodium citrate. I had to special order the stuff, but it lets me melt in whatever cheese I want - including sharp, hard cheddar - into regular milk (or even water), which really helps the cheese sing. I'm looking forward to incorporating the chiles and spices above on my next round. Yum! Why do you run the sauce through the blender? Is it to incorporate air? Does it affect the taste? 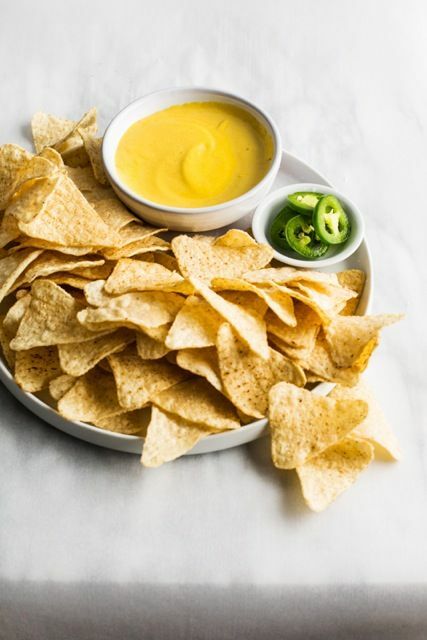 You don't have to, but if you don't it will be a bit chunky from the onions green chiles and tomatos, which is more like chile con queso than movie theater nachos. Feel free to skip it! THis looks SO good...just what I was looking for to serve to my Super Bowl guests. Thanks! Green chile can be found in the Mexican food aisle in most supermarkets. Of course, you can use fresh, roasted, skinned and seeded chiles, but the canned version which is already chopped is just as good for this recipe. 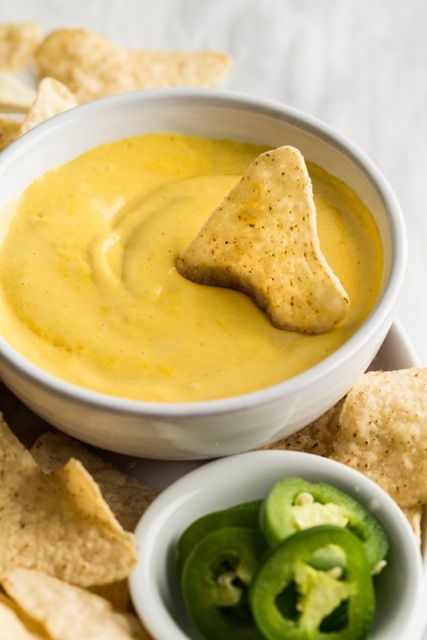 I shudder to think of all the nacho cheese dip I ate in high school...ugh. I can't wait to give this one a try! My family will devour it. Thank you for sharing! Wow!! We both on our movie nights always look forward to eating them..I always wonder how unhealthy they are but this homemade version looks so much better! Need to try this! Thanks Lara!! The description of the movie theater nacho cheese is truly horrifying!